The Payroll team hosted training sessions for team members on Monday, March 18-Friday, March 22. Explore the links below to download the training guide or watch a pre-recorded session. View the pre-recorded session here! Now that the MyWay PeopleSoft Time & Labor system is live, be sure to check your personal and payroll information (including direct deposit!) is accurate and that nothing was changed or lost during the transfer of data. You must do this as soon as possible to avoid any issues with your next paycheck. With the first payday in the new system right around the corner, it is particularly important that you verify your Direct Deposit and W4 information as soon as possible to ensure you receive your paycheck in a timely manner. Even if you already have direct deposit, it’s crucial that you verify your information in the new system. You can verify your direct deposit information by logging in to MyWay – PeopleSoft, clicking on the My Payroll tile, and selecting Direct Deposit. To verify your personal information, login to MyWay – PeopleSoft, go to the Team Member Self Service tile and click Personal Details. Our new and improved payroll, time and scheduling system is here! Mouse over the graphic below to learn more about what functions related to Payroll & Timekeeping are or will be available to you in MyWay–Peoplesoft. Click here to get started on MyWay. Want to make sure you’re paid on time every time? Switch to direct deposit or our pay card program today! ¿Quiere asegurarse de que le paguen a tiempo siempre? ¡Cámbiese hoy a depósito directo o a nuestro programa de tarjetas de pago! In 2019, we will no longer issue paper checks. Team members will instead be paid via direct deposit or a paycard (similar to a pre-paid bankcard) with the amount already loaded. This is a more efficient way to make sure our team members get paid on time every time. No more worrying about whether or not the USPS is making deliveries during a snow day or paying steep fees to a check-cashing service! Still like paper checks? We’ve got you covered! You’ll have access to unlimited blank checks that you can use for everyday transactions. 1) Delivered to your home address instead to your work address. Ensure your paycheck is sent to the correct location by logging in to MyWay–PeopleSoft, selecting the Team Member Service Center tile, and confirming or updating your home mailing address. 2) Paper paychecks will now be mailed from the ADP office in Georgia, which means they may arrive at your home 3-5 days after the scheduled payday. Sign up for direct deposit by logging in to MyWay–PeopleSoft, clicking on the My Payroll tile, and selecting Direct Deposit. Sign up for a paycard by logging in to MyWay–PeopleSoft, clicking on the Team Member Service Center tile, and submitting a request to Payroll through the Submit a Question to Payroll option. Note: Requests submitted by Wednesday of each week will be available for pick up at one of the main Payroll offices, including Payroll’s new Edison location (2163 Oak Tree Road) by Thursday of each week. REMINDER: Download historical pay statements as needed before they are no longer available. Historical pay statements will only be available in the current systems for approximately two months after the MyWay–PeopleSoft go live on March 24. If you or your team members anticipate needing copies of your historical pay statements, you should access them in the current system as soon as possible and download or print copies for your own personal records. Please inform your team members of this transition and let them know they must act soon if they anticipate needing any of this historical information. This year, Hackensack Meridian Health is making a very exciting transition and upgrading our time and attendance system. This includes installing brand new KABA clocks at each facility which will be integrated with payroll through our new MyWay – PeopleSoft system. It is very important all team members who hold non-exempt/hourly positions enroll in these new clocks as soon as possible. REMEMBER TO USE YOUR MYWAY-PEOPLESOFT ID! You can literally enroll with just the touch of a finger! It only takes 2-3 minutes. Just follow the step-by-step instructions to the right to enroll. Find out where the KABA clocks are located within your facility (or at a facility near you) by viewing the locations to the right. When should I start using the new KABA clocks? Now – we began using our new KABA clocks on Sunday, March 24. What if I use a web clock? Team members who currently enter time using a computer will start using the web clock functionality in MyWay–PeopleSoft starting Sunday, March 24. I have a question regarding my paycheck. What should I do? If you have any questions regarding your paycheck, hours worked, or anything else related to payroll processing, please contact your leader before submitting a ticket or escalating the issue elsewhere. Your leader will answer any questions and address any issues. If they are unable to answer your question, or if your issue requires further escalation, they will escalate it to the proper department. My pay was incorrect and is less than it should have been. When will I receive the rest of my pay? Payroll will be running off-cycle paychecks to reconcile all approved adjustments next week. When your off-cycle adjustment is processed will depend on when it was submitted. My pay was more than it should have been. How will this be corrected? Any negative adjustments to a paycheck, which would only take place if you were paid more than is accurate, will be deducted from your next regularly scheduled paycheck, which would be on Friday, April 26. Why am I just now seeing the spousal and/or tobacco surcharge being deducted from my paycheck? All team members who identified themselves during Open Enrollment as tobacco users or as having a spouse with other healthcare coverage will begin to see the tobacco and/or spousal surcharges starting this pay period (pay period 8). The surcharges are fees and therefore will be deducted from paychecks as necessary post-tax rather than as pre-tax benefits. What do the 401k deductions mean on my paycheck? After Tax Deductions: This reflects the amount of any ROTH contributions you may have. For more information regarding HMH matching and retirement deductions, please visit TeamHMH.com/Retirement. Why do PTO Hours no longer count towards total hours worked? This is a part of the new PTO policy which takes effect this pay period. According to the new policy, PTO hours no longer count towards hours worked, and therefore may affect when overtime is paid. You can see the new PTO policy on TeamHMH.com/policies. Why do I not see a direct deposit in my bank account? If you do not see a direct deposit in your bank account, but you do see your pay statement in “View Paycheck”, please go to “Direct Deposit” tab on the left hand side when you click the My Payroll Tile. Please check to see that your direct deposit information is accurate and set up correctly. If there is no direct deposit set up, that means a live check would have been processed. As previously communicated, live checks are mailed from ADP HQ in Atlanta, GA, and you can expect to your check within 3-5 days. Please be sure to update your direct deposit in MyWay-PeopleSoft immediately so it is corrected for the next pay check. If there is direct deposit information listed, but the account information is inaccurate, please contact payroll at 732-509-5500 to notify them and then go in and correct your account information. What are the advantages of moving all HMH payroll processing to MyWay – PeopleSoft? Moving all HMH payroll processing to one system greatly simplifies and streamlines the pay process. Bringing all team members onto the MyWay system also allows everyone to use MyWay to do things like track their pay, track and request PTO time, adjust their W4, change their direct deposit accounts and direct their pay to more than one direct deposit account if desired. What is the first payroll period in which MyWay-PeopleSoft will be used? HMH will be processing network-wide payroll out of MyWay-PeopleSoft with the pay period that starts on Sunday, March 24 and ends on Saturday, April 6. That means the first payday using the new system will be on Friday, April 12. Is it true that HMH will no longer issue paper paychecks after we move to the new MyWayPeopleSoft system in April 2019? 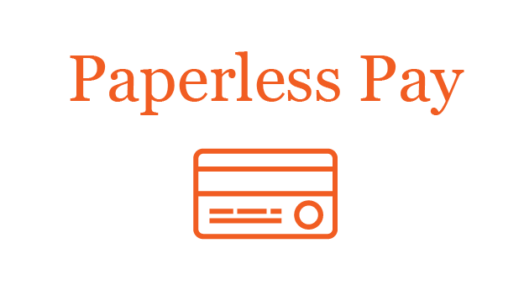 HMH will soon be moving to a paperless pay system, but there will be a grace period for team members to enroll in direct deposit or pay cards. Those team members who currently receive a paper check will continue to do so until they enroll in direct deposit or the pay card system, which must happen before June 2019. Will there be a change in how and when I receive my paper paycheck after we move to the new MyWay-PeopleSoft system in April 2019? Yes, paper paychecks will now be mailed from the ADP office in Georgia to team members’ homes, so please make sure you have updated your home mailing address in MyWay-PeopleSoft to ensure your paycheck is being mailed to the correct address. Additionally, because paper paychecks are now being sent from Georgia, please note that it may take three to five days after the scheduled payday for you to receive your check. To avoid any gap in time between payday and when you receive your check, HMH strongly encourages all team members to enroll in direct deposit or the pay card program as soon as possible. A pay card is pre-loaded with your net pay on paydays and can be used like a debit card. If you still need to write paper checks, you will have access to unlimited blank checks linked to your pay card that you can use for everyday transactions. If you already have direct deposit, you will continue to have it and do not need to take action. Starting on Monday, March 18, you can enroll in direct deposit on your own via MyWay–PeopleSoft. Just go to the “My Payroll” tile in MyWay and click on “direct deposit”. How do I sign up for a pay card? Submit a case through MyWay–PeopleSoft. Simply login to MyWay, click the Team Member Service Center tile and select Submit a Question to Payroll. This is the preferred method of outreach and allows the Payroll team to track the status of questions/requests and take action more quickly. Requests for pay cards received by Wednesday of each week will be ready for pick-up at a designated location (one of the main offices) on Thursday of each week. Alternatively, you can always pick up from the new Payroll location at 2163 Oak Tree Road in Edison, effective March 18, 2019. The pay card program details and fee schedule can be found here. I currently have my paycheck split, some going to direct deposit and the rest as a paper check. Will this be affected by the transition? Team members who currently have a split between a paper check and direct deposit will receive their entire pay via direct deposit starting with the April 12 payday. Moving forward, split payments of paper check and direct deposit will no longer be permitted. If HMH is going to a paperless payroll process, will we still be able to view our paystubs? Yes, team members can go to MyWay–PeopleSoft to view their paycheck online, or visit the ADP website at any time to access or print copies of their paystubs. The link to ADP can be found under the Team Member Quick Links tile on MyWay–PeopleSoft. You will need your paycheck data from MyWay to register for IPAY. You will be able to register for ADP IPAY starting April 12, 2019. Registration instructions can be found here. How will I access my prior pay statements and W-2s after my payroll processing switches to MyWay–PeopleSoft? The current systems used to view pay statements and W-2s will be retired within two months of the payroll transition. If you wish to retain copies of your prior pay statements or W-2 forms it is recommended that you access them in the current system as soon as possible and download or print copies. Who do I contact if I have questions about my paycheck, timekeeping or scheduling during this transition? Send an email to payroll@hackensackmeridian.org. I recently enrolled at one of the KABA clocks. When will we start using them to clock in and out? The KABA clocks will go live on Sunday, March 24. Until then, you should continue to use your current timekeeping system. When should I stop using the time clock I currently use? Team members who are working on Saturday, March 23 but ending their shift before 12:00 am should punch in and out using the current clocks. Team members who start their shift on Saturday, March 23 but won’t punch out before 12:00 am should not punch in on Saturday, March 23. Instead, those team members should punch in after 12:30 am but before their shift ends on Sunday, March 24, using the new KABA clocks and have their leaders enter the time difference from when they would have punched in at the start of their shift. Starting Sunday, March 24, the current time clocks will be deactivated and the new KABA clocks will be activated. Team members must use the KABA clock to clock in/out from that point forward! Instructions for using the KABA clocks can be found here. I don’t use a time clock but I do enter my time using a computer. How will that change when the KABA clocks go live? Team members who currently enter time using a computer will continue to do so once the KABA clocks go live. However, you will start using the web clock functionality in MyWay–PeopleSoft starting Sunday, March 24. Instructions for using the web clock will be available here starting the week of March 18. I don’t use a time clock but I do enter my time using telephone time entry (IVR). How will that change when the KABA clocks go live? Team members who currently enter time using a telephone will continue to do so once the KABA clocks go live. However, you will start using the telephone time entry functionality within the KABA system, starting Sunday, March 24. Instructions for using the KABA telephone system will be available here starting the week of March 18. I’m a per diem. Do I need to punch in/out? Yes, all per diems, including professional per diems, are non-exempt employees and should therefore punch in/out via a physical KABA clock or the MyWay–PeopleSoft web clock. Do team members who need to record an “Exempt Present Punch” when they clock in/out need to enroll in the KABA clocks? Yes. This applies to exempt team members in certain long term care facilities who, for compliance reasons, need to report their presence. “Exempt Present Punch” does not track time, it is just a head count. Exempt team members who are not required to record “Exempt Present Punch” for compliance reasons must only enroll if they have additional jobs (secondary, tertiary, etc.). This does not apply to physicians. Physicians will not be using any time collection device and will report their hours via the Physician Time Study Report. How do team members on a leave of absence enroll for the KABA clocks? Team members currently on a leave of absence should be enrolled on their first day back at work. Which team members need to enroll in the KABA clocks? All non-exempt team members, as they are paid by time worked as opposed to exempt team members who are paid by schedule. Please note: There may be some exempt team members who have secondary or tertiary jobs in which they are paid by time worked. In that case, they will need to enroll as they must clock in/out for these secondary jobs. How long does the process take per team member? This process typically takes no longer than 2-3 minutes and requires no prep time other than to have your MyWay–PeopleSoft employee ID on hand. It couldn’t be easier! How do I find my MyWay–PeopleSoft employee ID? For the KABA clock enrollment, you will need your MyWay – PeopleSoft employee ID, also called your Team Member ID. What happens if I tried 3 times and the quality is still poor? Can team members use the MyWay–PeopleSoft web clock instead of the KABA clock if they work at a PC? Yes. In fact, it is preferred those team members use the MyWay–PeopleSoft web clock. However, it is recommended they enroll in the KABA clocks anyway, for those times MyWay is not available (for example: during system upgrades, the payroll go live, system patches, etc.). Will the KABA clock store an image of my fingerprint? No. The KABA system does not store your fingerprint. It stores different measurements of your finger and converts that data into a secure code specific to your MyWay – PeopleSoft employee ID number. The data cannot be reproduced to show a fingerprint image. Will my personal information be at risk when we switch to biometric clocks? Protecting the personal identity information of our team members is, and always will be, a top priority for HMH. The new KABA biometric finger scan is a timekeeping system that uses your MyWay – PeopleSoft employee ID number, along with a finger scan, to help verify and secure your personal information to ensure that someone else isn’t using your MyWay – PeopleSoft employee ID number to use the time clock. The KABA system does not store your finger print. Instead, it stores different measurements of your finger and converts that data into a secure code specific to your MyWay – PeopleSoft employee ID number. HMH does not share that data, period. This includes with any state or federal agencies. The data cannot be reproduced to show a finger print image. Subject to union negotiations. We are required by law to deal with the unions on behalf of unionized team members, and we will continue to do so. We will only negotiate with the unions, not with individual unionized team members.